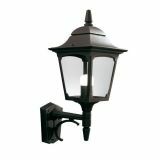 Our collection of Cast Iron Lamp posts & wall lanterns are made entirely of from High quality grey cast iron and are then finished as standard with a rich semi-gloss black finish. Inspired by history & tradition, this range of Dutch made Lamp Posts are without doubt the finest products of their type available in the United Kingdom. Normally supplied in Black, we can also supply other colours to special order as well as multi-head designs. We have spend a conciderable time researching our new range of Cast Aluminium Lamp posts, wall & porch lights and are very pleased to include them alongside our existing high quality ranges. Ideal for period properties both large and small.